Discussion in 'POTW Collaboration' started by Serebii, Sep 30, 2018. Time for the next Pokémon and this week we are going with a Kanto Pokémon! Ah Golem, once valued as one of the few viable normal resists in the game. 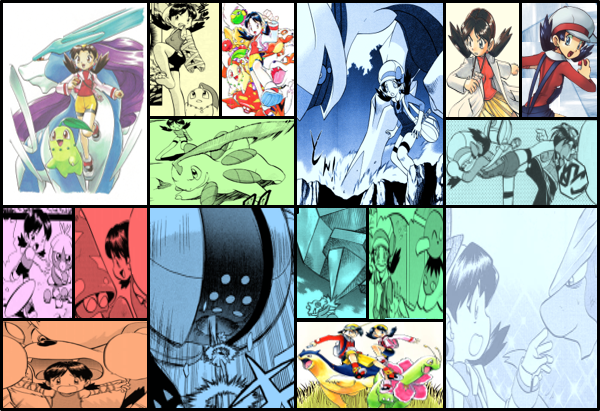 However, as the generations have gone by, the value of that niche has gone down and its crippling weaknesses towards Water and Grass alongside weakness to common types like Fighting, Ground and Ice prevent Golem from doing any walling for a significant amount of time. Base 65 SDEF is poor, meaning neutral hits will still do a decent chunk of damage. Base 45 Speed is decent for Trick Room, but there are plenty of foes both in and out of Trick Room that can outspeed it. So what can Golem do? Its Attack, sitting at a respectable base 120 is a good place to start. If Golem can attack, it will do some considerable damage, especially with its respectable Ground/Rock STAB combo. This set allows Golem to abuse its many common weaknesses to terrifying effect. 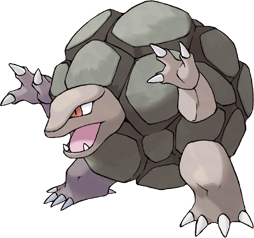 Allow Golem a Free Switch in, take the opportunity to throw up a Rock Polish while your opponent hits Golem with a Super Effective attack (that you will survive thanks to Sturdy) and Golem has just performed a pseudo Shell Smash and is ready to go on the attack. Earthquake is earthquake. Rock Blast and Stone Edge are your options for the rock STAB of Choice. Stone Edge is more powerful, while Rock Blast breaks through Substitutes, Focus Sash and Sturdy. Last move is up for preference. Even after a Rock Polish, Golem can still be outsped, so Sucker Punch is good priority, while Fire Punch is an option for Grass types that resist Earthquake. Note that any entry Hazards, priority moves will break this set, by breaking Sturdy or offing Golem after it has setup. MY BEARD GIVES ME SUPER STRENGTH! Galvanize Golem, once fully with setup, is one of the most dangerous sweepers out there. Other than grass-types, he pretty much covers much of the Pokemon types he's weak too including the all too common water-type. He is also arguably the most dangerous user of Explosion out there, Galvanize turning and boosting Explosion as a electric STAB move. However because electric-type covers flying-types like rock-types do, you may want Earthquake, even though it lacks STAB, as a counter against any fellow rock and electric types. Other than that, I got nothing. His electric typing and ability is both a blessing and a weakness. MY BEARD GIVES ME STRENGTH! I like the general idea of the set, but there are a few issues. Having Double Edge allows Golem to have an “Electric” move that isn’t just a one-time nuke. However, using Double Edge is pointless, since it will break the Focus Sash. It would be better to use a different Normal move, like Return or possibly Flail (due to the Focus Sash). shoz999 and Aduro like this. Is Steamroller considered a viable option on Alolan Golem? It would be an anti-Grass move more than anything. I know it isn’t good on normal Golem since it has access to Fire Punch. But could it work on Alolan Golem? Rock Head- basically useless unless you use Double Edge, and even then, it has better options. Sturdy- probably Golem’s best ability. It acts as a pseudo-Focus Sash, which is helpful given Golem’s numerous weaknesses. Sand Veil- people already hate evasion enough. And besides, why would you use Golem in sand? Magnet Pull- the only fully evolved non-Steel type to get this ability. Not really that useful. While it does give you a chance to KO a Steel type with a super effective move, almost ever Steel type can do the same to you. Since its in PU, Alolan Golem with Magnet Pull is a useful way to trap one of the tier's most annoying pivots, togedemaru. Oof. I didn’t know where it was tier-wise. I assume it is due to its quad-Weakness to Ground and its poor speed? For me personally, I don’t care about tiers unless it is about something being broken (like Mega Rayquaza), extremely bad, or being outclassed by something better. Magnet Pull is actually very useful on Alolan Golem, as it can deal with Steel Types that Stymie Magnezone, such as Heatran, Excadrill (a bit of a tie there...), and other Magenzone as well as getting most threats that Magnezone does (exceptions being Kartana and Ferrothorn, who are too quick/bulky to be dispatched by Earthquake/Fire Punch). That's part of it. Plus it can't set up rocks reliably and use galvanise at the same time. So its niche isn't that reliable. Alolan Geodude can be pretty good though, since its a rock setter that can reliably OHKO Mareanie, and explosion is going to take out something. It even runs fire blast sometimes so ferroseed isn't a reliable counter.